Air taxis will soon be operating in Singapore - allowing passengers to avoid any traffic chaos below on terra firma. The Civil Aviation Authority of Singapore (CAAS) has announced the first aerial trials will take place later this year, Travel Mole reports. The air taxis are mini helicopters made by German company Volocopter and can accommodate two passengers in short hops of up to 30km. 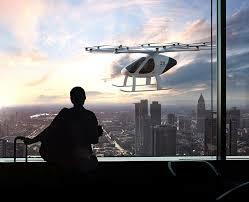 The Volocopter can be flown with a pilot or remotely from the ground ( I don't like the sound of that very much!). The new air taxis will have 'unprecedented levels of safety' said Volocopter CEO Florian Reuter. "In order to be operating these vehicles in cities around the world, we need to be as safe as commercial airlines," he said. "That is the safety level that has been set for this vehicle." Tests will begin with a series of private flights over water manned by a pilot and then progress to public flight trials. "We are looking at how we can use air transportation to complement our land transportation," said Tan Chun Wei, CAAS deputy director of transformation programs. A number of routes have been identified for possible operational flights after the service has been certified including international journeys north to Johor, Malaysia, and south to the Indonesian island of Batam. The volocopter has a maximum airspeed of 100kmh and can stay airborne for up to 30 minutes.